The 'Lego House' singer and the 'Friends' star have been drinking together and the 22-year-old says they've become such good friends she lets him stay at her luxury beach house. 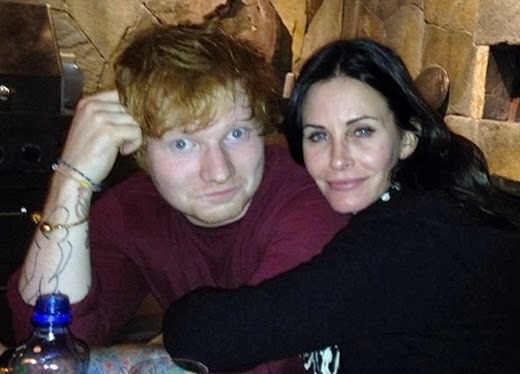 Ed posted a photograph on his Instagram with Courteney - famous for her role as Monica - to encourage his fans to vote for her to win Favorite Cable TV actress at the People's Choice Awards. And in the supportive message, the 'Small Bump' hit maker added: "She lets me live in her beach house." The post read: "My friend Courteney is nominated for a People Choice Award for favorite cable tv actress. "She's never won one before and she lets me live in her beach house, so how's about we all vote for her and win her the damn thang eh? Safe." Fans were shocked to see the two together and one commented: "You've gotta love Ed Sheeran that little bit more now. Awwh :)"
The 49-year-old actress, who divorced David Arquette in May this year after more than 10 years of marriage, has been nominated for the 2014 award for her role as Jules Cobb in the American sitcom 'Cougar Town', which has also been given a nod in the Favorite Cable TV Comedy category.